Quebec City is surrounded by some of the prettiest and most interesting natural and built attractions in Canada. No trip to the area is complete without seeing Montmorency Falls, Ile d'Orleans and the Cote de Beaupre. To reach these three attractions requires a short drive east of Quebec City along the north shore of the St. Lawrence River. 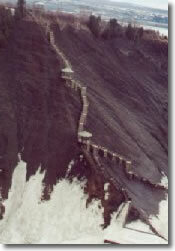 Highway #40 is the quickest route to Montmorency Falls, fifteen minutes east of the city. 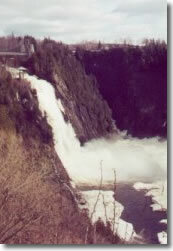 Montmorency is the largest of a number of significant waterfalls along the Beaupre coast. The falls are impressive, in their 272 foot drop from the top of the ridge into a deep bowl-shaped basin at river level. A cable car takes visitors to the top for a hike to viewing belvederes and the suspension bridge over the cascade at the top of the ridge. Standing on the viewing platforms and on the bridge it's easy to believe that Montmorency Falls are 98.5 feet higher than Niagara Falls. 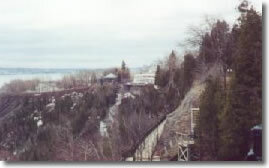 From the top, the full impact of the 487 panoramic stairs down the bluff on opposite side of the gorge can be seen. The stairway and lookouts seem precariously balanced as they snake down the ridge but they're safe to descend. Views of the falls from various platforms along the way are spectacular. As walking down is a lot easier than hiking up, take the cable car to the top and the stairs back down again. 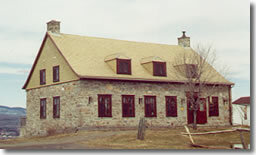 There's an Interpretive Centre on the second floor of impressive Manoir Montmorency, built in replica, on the foundations of an earlier mansion. The first home was built on this site by Sir Frederick Haldimand in 1780 after which it was the home of the Duke of Kent, father to Queen Victoria and his mistress, the Lady of Saint Laurent. Restaurant du Manoir boasts one of the best chefs in North America and serves an excellent evening table d'hote. Diners enjoy excellent views of the falls and gorge while having lunch on the verandah. 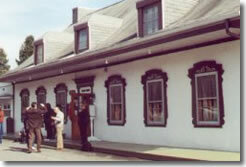 Sunday Brunch at the Manoir Montmorency is a Quebec tradition. 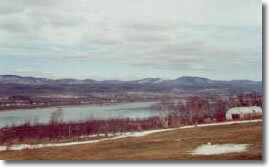 Ile d'Orleans is a shining jewel in Quebec's crown. 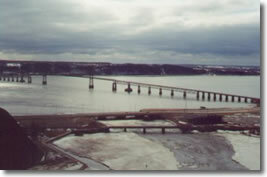 The bridge to the island is on Highway #40 a little west of Montmorency Falls. Although Jacques Cartier laid eyes on this emerald green island in the mid-sixteenth century, it wasn't until the early eighteen hundreds that immigrants from Normandy France populated the fertile land. The island is a cosmos of early Norman and Regency architectural styles, economuseums and specialty food producers. Today's crops include potatoes, strawberries and apples. From its one kilometre width at the west end, a gorgeous view over Quebec City is worth a few pictures. Ten kilometres wide at its east end, the historic island packs a lot into a very small space. There are three villages and more than six hundred buildings that are historically and architecturally significant. Some of the buildings are of Scottish yellow brick that arrived in Canada as ship's ballast. The island boasts the oldest golf course c1868 and the oldest chapel in Canada. 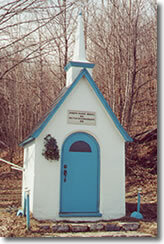 There are also several little roadside praying stations called processional chapels along its quiet byways. While driving, watch too for a well-marked very large stone, the only erratic granite rock found on the island. Due to the island's location, right in the middle of the busy St. Lawrence River, ocean going ships pass on the south side. Tides affect the north side so much it's too shallow for shipping lanes. Water tastes salty this far up the river and salt marshes are a predominant feature of the landscape. Economusee are run by craftspeople who use traditional techniques in production, teach while plying their trade and fund their operations through the sale of their crafts or products. 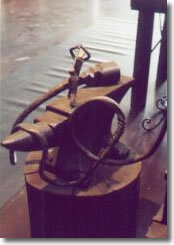 There are a number of economusee on the Ile d'Orleans including La Forge a Pique-Assaut and Domaine Steinbach. At the forge, blacksmith Guy Bel, an art metal worker par excellence, creates some most imaginative and creative metalwork pieces and one-of-a-kind items, some for sale in his shop. 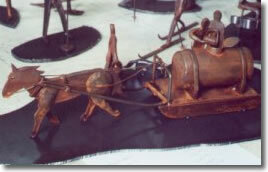 Guy's traditional work can be seen in various historic restorations in Nova Scotia and Quebec. He is joined in this trade by Sylvie Lavoie, Patrice Bel and Denis Lebel. At the moment Guy has taken on the additional challenge of crafting a perfectly balanced golf club. At Domaine Steinbach, Claire, Philippe and family harvest apples from their organic orchard and make exquisite apple ciders, vinegars, mustards, onion preserves, ketchups, pickles, jams and jellies. Ducks and geese are utilized in the orchard and processed into excellent duck terrines, pates and confits. Visitors are welcome to drop in at Domaine Steinbach. Costumed staff explain the operation and product is sold from an on-site store. 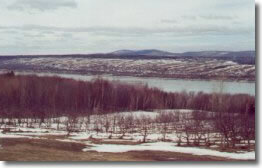 Orchards slope toward the St. Lawrence River and there are gorgeous views of the brooding Laurentian Mountains beyond the north shore. 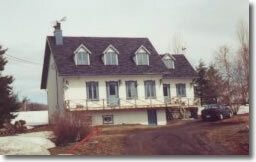 Domaine Steinbach also operates a bed and breakfast out of their pretty historic stone habitation. When you leave the island by the same bridge you arrived, don't turn left or right on #40/138. Boulevard Sainte-Anne lies ahead of you and leads to Boulevard des Chutes which in turn becomes Avenue Royale. 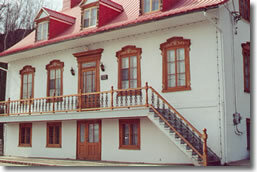 Many of Quebec's built treasures can be found by driving east along scenic Avenue Royale. There are some fine examples of Norman, Regency and Habitant architecture with their sloped roofs, balconies, large unscreened windows, dormers, huge chimneys that anchor buildings at each end and narrow long properties that run to the St. Lawrence River. The road is lined with heritage structures, root cellars and processional chapels. Streams that begin in the Laurentians to the north of the Beaupre coast, flow in abundance down the coastal ridge. 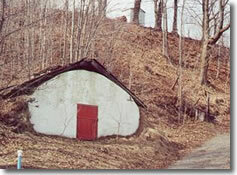 Sugar shacks are tucked into maple forests. Red roofs and white walls are in stark contrast to green fields and blue river. A number of economusee are located along this route. Watch for signs. The Du Petit Pre Flour Mill is now a winery. Their raspberry wine is excellent. The Musee de L'Abeille, a facility dedicated to museum production, sells a line of honey products and specialty food including an addictive creamy caramel sauce. The Fromage Affineur at Baie-St-Paul makes a marvelous Migneron cheese. No visit to the Cote de Beaupre, the Beaupre Coast, is complete without dinner at Auberge Baker, the Baker Inn and Restaurant. This c1840's habitation is charming with its dining areas and five inn rooms. This is a great place to spend a night or two while exploring the Cote de Beaupre. Auberge Baker's table d'hote is fabulous. One of the finest meals during our trip to Quebec City and area was served at Auberge Baker. My choices were marinated Atlantic salmon with dill mousse, yellow pea soup, traditional Quebec Platter of Lac St-Jean pie, meat pie and pork hock and meatball stew, a selection of chef's desserts including sugar pie, creme caramel and seed tile, and coffee. Magnifique!